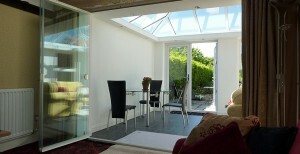 A glass wall can be removed/replaced in seconds! One of our clients advised us of ‘before and after’ valuations of his property, meaning before SunSeeker UltraSlim Doors were installed and after they were installed as part of a project. The difference was a staggering 27.5%! Enhancing your home has several benefits. First of all, you usually have more space and, if you choose UltraSlim slide-and-pivot doors, your new, contemporary lifestyle seems more calm and less cluttered. A great benefit is the additional natural light pouring in through the glass panels, virtually uninterrupted by the 38mm sightlines where two door frames meet. And, with the doors fully open, the house and garden virtually become one large living space. Suddenly, the house seems much larger than it did before. The visual appeal of a ‘wall of glass’ is a boon to selling a house but there are other benefits, too. Today’s building regulations ensure that home extensions and replacement doors and windows provide better insulation so that homes do not lose heat during colder months and will, therefore, save money on fuel bills. The choice of frame colour plays its part, too. 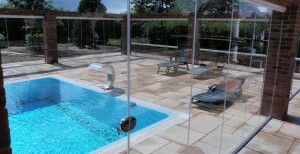 Graphite grey, our standard recommended colour, has proven very popular as it blends well with most surroundings. We manufacture more doors with grey frames than with white frames; we think this is because most homes where a wide set of UltraSlim Doors are installed do not need to consider matching in with existing window frames. 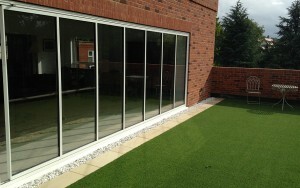 Although we market our UltraSlim as slide-pivot doors, we also manufacture and install them as windows, where required. It’s the same technology but about half the height! Where we have installed a width of fully retractable windows, above radiators in the dining area for example, it’s almost like eating on the terrace; a wide expanse of open windows from the kitchen area to an outside patio can be very useful for serving from. UltraSlim frames are made of powder coated aluminium, which is extremely resistent to scratching and requires virtually no maintenance to keep it looking great – just an occasional wipe down with a damp cloth after a particularly dusty storm. You can see a variety of frame colours and client installations on the gallery page of our website, including greys, green, white and black (note that non-standard colours will incur additional charges). If you’d like us to email you a provisional quotation for your made-to-measure UltraSlim doors, without further obligation, please complete the quotation request form.